Cascade Mountain, a recently renovated central Wisconsin resort, is located between Madison and the Wisconsin Dells. This newly revamped facility offers an improved beginner slope with lift access, remodeled base lodge facilities, an expanded rental shop, and extended hours for weekend skiers. Especially convenient with a location right off Interstate 90/94, this location prides itself on its family atmosphere. Mountain Stats With an average natural snowfall between 50 and 56 inches per year, this Wisconsin ski resort doesn’t have much need for snowmakers—but it has 100% coverage just in case. With a maximum vertical drop of 460 feet, and 160 skiiable acres, it’s a good thing the facility is also equipped with nine lifts: two quad chairs, three triple chairs, two double chairs, one surface lift, and the first high-speed detachable quad chair in the Midwest. Trail difficulties range from green circle to black diamond, with a 38/24/38 split—an impressive 34 trails in all. Tubers will also be happy to hear that Cascade Mountain offers five trails and a Magic Carpet lift just for them. Accommodations Cascade Mountain doesn’t offer on-site lodging, but they do have ski packages available with several Wisconsin Dells area hotels. A unique African-themed hotel with several amenities, including the Kalahari Salon and Spa, and America’s largest indoor waterpark. Riviera Suites: Kids under 12 stay free, and this hotel offers economically-priced rooms starting at $40.00. Also a family-oriented waterpark hotel, this resort also offers suites, villas, and condos. Sand County Service Company: Offers property rental that include cottages, condos and vacation homes with extras like fitness rooms, game rooms, and indoor Jacuzzis. Bakers Sunset Bay Resort: This resort offers ski packages starting at $79.00 per night, as well as a heated indoor pool, waterslides, a sauna and a Jacuzzi. Rustically located in the wooded Lake Wisconsin Recreation Area, this inn is right outside of Madison, Wis.
Offers free skiing and lodging for kids under 12, as well as the closest accommodations to Cascade Mountain. Restaurants Cascade Mountain offers five different on-site locations for hungry and thirsty skiers. Food and drink can be found at The Peak Cafe and Bar, the Snackbar, the Daisy Cafe and Bar, the Coffee Shop, and the Outdoor Cookout. Along with hot and cold food and beverage options, visitors to these spots will find fresh-baked desserts. For recommendations on off-site local restaurants, check with Cascade Mountain’s staff. 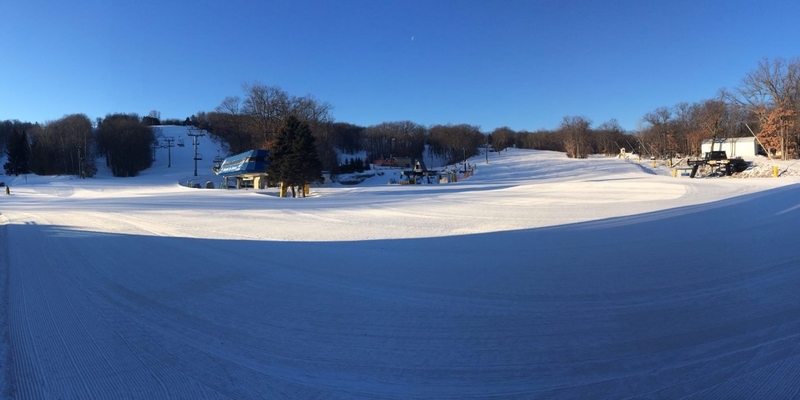 Wisconsin’s Cascade Mountain offers a convenient location, proximity to dozens of hotels and combination waterparks, and over 30 slopes for skiing and tubing enjoyment. Families looking for a new yearly vacation destination should definitely check out this newly-renovated ski area. As we wrap up another season, I have to say that we had a lot of fun this year. The Cascade team would like to thank everyone that took the time to share that with us, from friends and family to guests and employees. While we start focusing on summer activities in the near future, there will always be a part of us that is looking forward to fun on the slopes and snowflakes in the air- we hope you feel the same.